All favorite Indian diva Aishwarya Rai Bachchan is resuming her acting career with upcoming movie Jazbaa. The movie is directed by Sanjay Gupta and jointly produced under the banners Essel Vision Productions, Viiking Media & Entertainment and White Feather Films. It features Aishwarya along with Irrfan Khan in lead roles and Jackie Shroff, Shabana Azmi etc in crucial supporting characters. Jazbaa is an official remake of South Korean movie Seven Days that was released in 2007. The movie is scheduled to be released on 9th October 2015 worldwide in various languages. Jazbaa was in good buzz from March, when the first look of Aishwarya was released out. Yesterday its official trailer was out on YouTube and no doubt that the craze of audience towards it, has been revived. 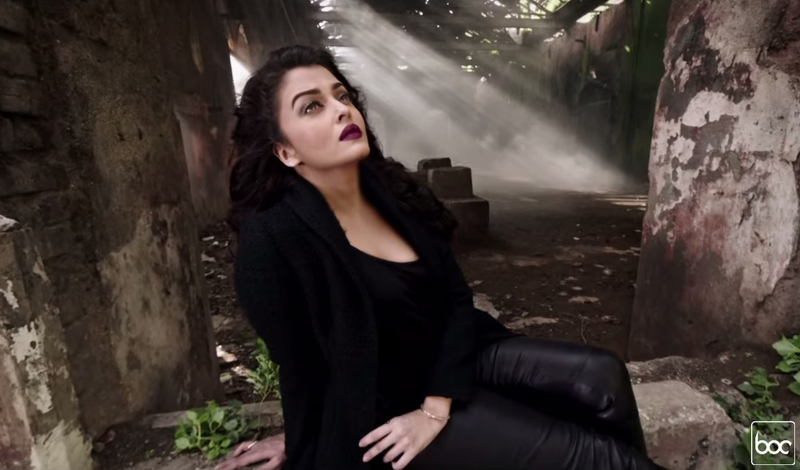 The trailer of Jazbaa is looking very promising and everyone liked it. Within 20 hours of release, it was received more than 1 million views. The 2:31 minutes theatrical video is integrated with thrilling sequences & burly dialogues. In the movie, Aishwarya is playing a role of an Advocate and Irrfan will be seen as a cop. We must say that Jazbaa is a very well star casted movie and expected to get excellent response after release. Fans are very much excited to see Aishwarya on silver screen after a long time. Also we are very well aware about the acting skills & versatility of Irrfan Khan, he is one of the finest actors in Bollywood and having high fan following worldwide. The presence of these two, is enough to make Jazbaa hit at box office. Inspector Yohan, tumhara yeh Amitabh Bachchan look aur tevar, yahan kaam nahi karega. Irrfan Khan: Toh aap bataiye, main kya Singham ban ke ghumu? Jackie Shroff: Advocate Verma jeetne ke liye ladti hai aur jeetna uski aadat hai. Shabana Azmi: Iss waqt aap sirf ek lawyer hain, jo har haal mein apna case jeetna chahti hain. Irrfan Khan: Rishte mein bharosa aur mobile mein network na ho, toh log game khelne lagte hain. Irrfan Khan: Sharafat ki duniya ka qissa hi khatam, ab jaisi duniya vaise hum. Irrfan Khan: Teri amma ne jiske baare mein nahi bataya, main tera woh baap hun. Aishwarya Rai Bachchan: Aapke kanoon ke lambe haath, meri beti ke liye chhote pad gaye hain. Irrfan Khan: Aasoon bahane ka waqt gaya, jung toh ab shuru hogi. Aishwarya Rai Bachchan: Tujhe zara bhi andaza nahi ki ek maa pe kya gujarti hai, tera case bhi ek maa lad rhi hai waqeel nahi…samjha?